A spellbinding debut novel about the trailblazing 1960s poet Forugh Farrokzhad, who defied Iranian society to find her voice, and love--inspiring generations of women to come. Whether gossiping with her sister among the fragrant roses of her mother's walled garden, or sneaking out to flirt with a teenage paramour over café glace, Forugh Farrokzhad had always rebelled. Though Iran was Westernizing in the 1940s, during Forugh's childhood, most of the country still believed that women were not to be heard from. Yet, at age eleven, young Forugh began writing poems to impress her strict, disapproving father--and a passion for words lodged deeply within her. When she ended up in an arranged marriage at sixteen, she ran away, leaving behind her new husband and infant son. She fell into a passionate affair that only increased her creative wingspan, leading her to explore the meaning of captivity and exile. Upon publication, her poems were considered both scandalous and brilliant; Forugh was at once a national treasure and the devil herself. She persevered, living life by her own rules, but at the cost of love, friendship, and eventually her own life, cut tragically short at the age of 32, amid the violent upheaval of the budding Iranian revolution. In subsequent years, Forugh's poetry was banned, the presses that printed her work burned to the ground, and citizens forced to hide away their treasured collections of her verses. To this day, Forugh Farrokhzad represents the birth of feminism in Iran, and Jasmin Darznik uses the lens of fiction to capture the tenacity, spirit, and ecstatic turmoil of this iconic woman. "Song of a Captive Bird is a complex and beautiful rendering of that vanished country and its scattered people; a reminder of the power and purpose of art; and an ode to female creativity under a patriarchy that repeatedly tries to snuff it out." "A thrilling and provocative portrait of a powerful woman set against a sweeping panorama of Iranian history." "[A] sumptuous debut novel....Darznik’s marvelous homage to Forugh captures the frustration and determination she must have felt to overcome the strictures of her environment, beautifully recreating her difficult path to fame." "Darznik's enthralling and illuminating novel will introduce Farrokhzad to a whole new world of readers." "Darznik captures Forugh’s remarkable bravery and tenacity as she persues her dream of becoming a published author and documentary filmmaker….Readers can't seem to get enough of fictional biography, and this first novel from Iranian American memoirist, professor, and essayist Darznik is a poignant, mesmerizing addition to the genre." 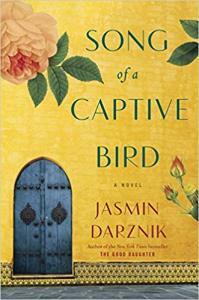 “Song of a Captive Bird is an unsparing account of the necessity and consequences of speaking out!" "[Feminist icon Forugh Farrokhzad] inspired Darznik's imaginative debut novel: the story of a gifted iconoclast defying gender expectations in the mid-20th-century Iran." "Darznik sumptuously captures a fierce and turbulent life, as well as a vanished country swept away by revolution." "Jasmin Darznik's moving portrait of Forugh Farrokhzad does true justice to the brave voice of a poet, beloved by generations of Iranians, whose work should be better known. Alive and sensuous, Darznik's prose mirrors Forugh's poetry, making no separation between life and work, leaving open and unguarded that door we so often find closed."